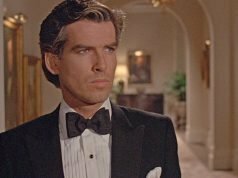 For Tomorrow Never Dies, costume designer Lindy Hemming looked to the 1930s for inspiration in designing Pierce Brosnan’s Brioni dinner suit. 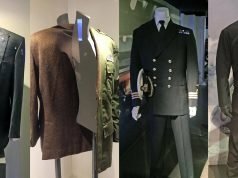 The 1930s saw many innovations in black tie by the Prince of Wales that continue to this day, such as midnight blue dinner suits and turn-down collar-shirts. 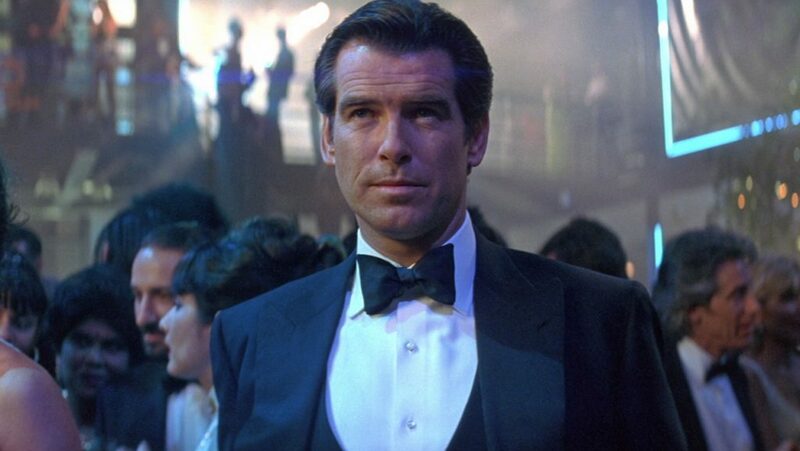 Bond’s button one dinner jacket is midnight blue barrathea wool with midnight grosgrain-faced pointed lapels. Covered buttons match grosgrain lapels. Slightly wider lapels and Brioni’s typical strong shoulder are consistent with the 1930’s look. The dinner jacket has jetted pockets, four-button cuffs and no vents at the back. The trousers have a grosgrain stripe down the side of each leg and double reverse pleats, a modern touch as opposed to the more traditional forward pleats that would more likely have been found on a dinner suit in the 1930s. I consider the reverse pleats to be the only downside to this outfit. The most unique 1930’s element is the black five-button, shawl lapel, double-breasted waistcoat. Even then this was not a popular style. The most common double-breasted waistcoat for evening wear has four, or occasionally six, buttons. The five buttons here are placed in a V-formation, and the buttons come out to be a little higher than the standard evening waistcoat yet still much lower than a waistcoat for daytime. The waistcoat is made in the same cloth as the rest of the dinner suit, with grosgrain lapels as well. The Turnbull & Asser dress shirt is a more formal variation than Bond had ever worn before. Raising the formality is a marcella bib front without a placket and mother of pearl studs. This style front comes from the white tie shirt and was the style originally worn with black tie. Traditionally, mother of pearl studs were only worn for white tie and black onyx studs were worn with black tie, though what Bond wears is not incorrect. In the 1930s people started wearing shirts with attached turn-down collars and pleated fronts with black tie, but wing collars and marcella bibs were still popular with black tie. Here Bond pairs the less formal spread collar with the more formal marcella bib. The collar and double cuffs are also marcella. 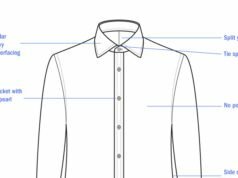 The body and sleeves of the dress shirt are made of a sheer cotton voile and the back of the shirt is cut with side pleats. The marcella front and turndown collar is a popular combination and more acceptable than the reverse: a wing collar with a pleated front. The midnight bow tie is a wide butterfly shape that balances the wide lapels. Bond’s shoes are black oxfords. Whilst the studs and waistcoat are not particularly Bondian elements, and probably not things that Ian Fleming would consider, this is one of the most unique and interesting—but still classic and elegant—black tie ensembles of the series. Thanks very much for posting this. This is an excellent dinner jacket with a bit of a strange waistcoat and an excellent shirt. I do have a question: The front has two studs on top and buttons down the rest of the shirt. I thought marcella would be too stiff for buttons. I removed that part of the article because I’m actually not sure if the studs extend down the bib. Until there’s a Blu-ray release it’s hard to tell what are studs and what are mother of pearl buttons. The shirt is slightly odd in that the bib extends down to at least the fifth stud/button. Typically a bib is 3 or 4 studs in length with buttons below the bib, though I have seen buttons on a marcella bib. Studs typically aren’t worn where they are not visible. 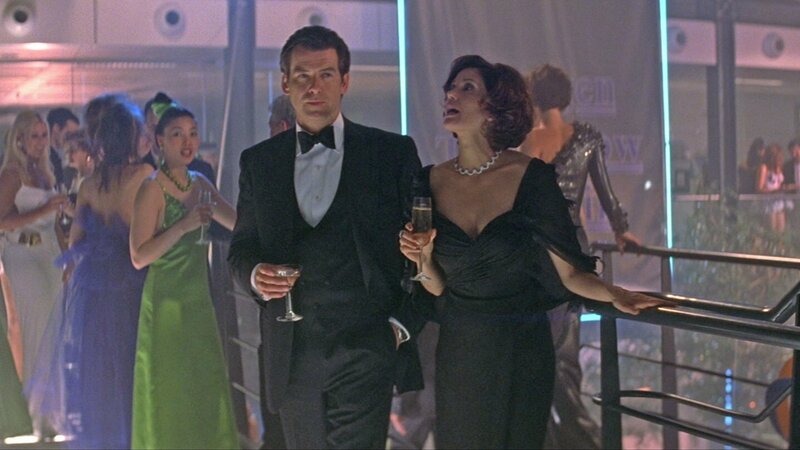 I doubt Bond’s shirt is starched as stiffly as a white tie shirt would be, and when not starched marcella is soft. If the shirt indeed has 5 studs they would of course have been specially ordered for Bond. Did you have a look at the Blu-Ray? Looks like studs all the way to me.. In a shot from the side where Bond is standing it looks like there are four studs and the fifth one is a button. It looks flatter than the rest. The buttons and studs look very similar since they are all mother of pearl. Excellent post. Keep up the great work in the new year. I suppose you leave the last button on the waistcoat buttoned like you do on the white tie waistcoat? Yes, all buttons on any evening waistcoat are fastened, whether single- or double-breasted. Even on day wear double-breasted waistcoats all buttons are fastened. Surely this is inspired by Robert Vaughn’s evening wear in the Man From UNCLE? Though the waistcoats are both double-breasted, Brosnan’s waistcoat is a much different style. Brosnan’s outfit overall looks more 1930s whilst Vaughan’s is more characteristic of the Edwardian revival in the 1960s. Other than the suit worn when Bond gets off the plane in Casino Royale, did Bond ever wear a peak lapel lounge suit? If so, in which films? Here is a picture of the peak lapel lounge suit. No, that’s the only single-breasted suit with pointed lapels that Bond wears. It’s an old look that has returned to popularity in recent years, though some people see it as a mismatch of styles. firts of all, many thanks about all the information that you have inserted here on this topic. Please, are you able to help me with some questions that I need to know about the white formal shirt used on these scene? What questions do you have? I tried to explain the shirt in an much detail as I could in the article. Great article, Matt. The precision is impressive ! I never noticed the waistcoat’s original shape in the movie, unfortunately, since the all black outfit doesn’t really help. What have you against the reverse pleats here, might I ask ? Surely people wore forward pleated trousers more often than reverse ones in the 30’s, but it didn’t prevent some others to wear reverse pleats with black or white tie ! Or perhaps you just think forward pleats look better ? I think forward pleats look better, and they are more historically appropriate with that waistcoat style. Is a black waistcoat acceptable for a midnight jacket? 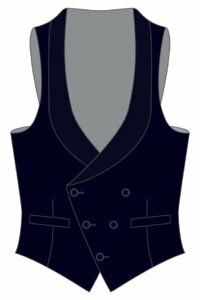 If the midnight dinner suit has black silk facings then the whole waistcoat can be in a matching black silk. If your waistcoat has a wool body, it needs to match the jacket and trousers in midnight blue. Likewise, the facings on a wool waistcoat should match the facings on the jacket and trousers. I’m assuming the shirt is a bespoke design from turnbull asser? 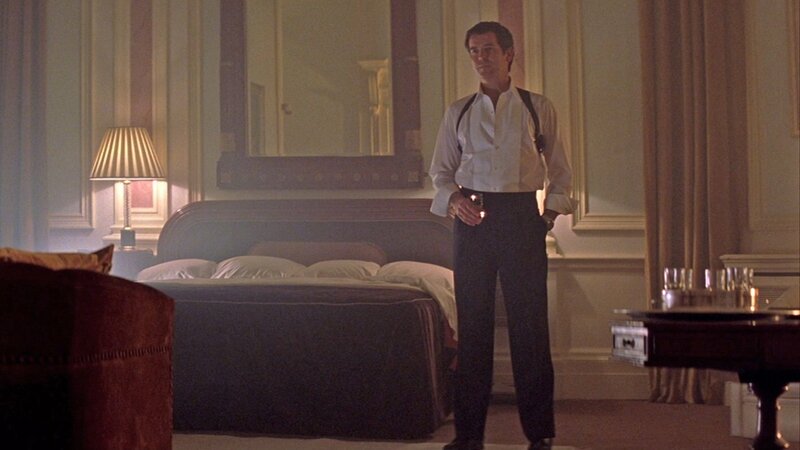 Yes, all of James Bond’s shirts from Turnbull & Asser are bespoke.